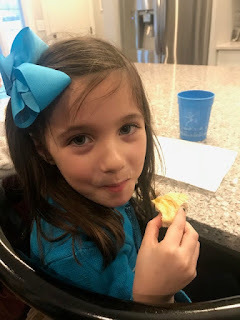 Last week, Hailey cam e home from school raving about some bread that she had made at school that day. "It was so warm and yummy, mommy, we have to make it at home!" she demanded. 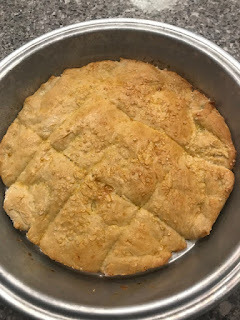 Once secured, I had to add the ingredients to my grocery list and then finally we were ready to make the Slovenian bread. 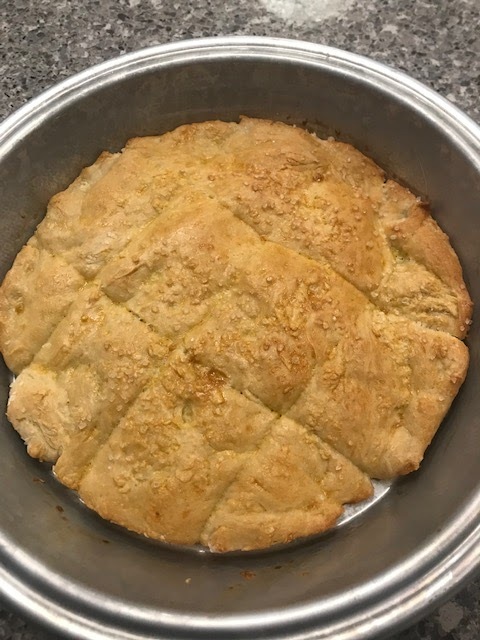 So one afternoon when we didn't have gymnastics, soccer or dance, Hailey dragged over her stool, put on Austen's old dinosaur smock/apron and we made two pie pans full of Slovenian bread. And it must've been good because by that evening, both were gone. Hailey once again declared it yummy and Austen and Peyton devoured their pieces. I thought it tasted similar to a pretzel (but I think a true soft pretzel is way better). Nonetheless, Hailey was happy, it was a fun afternoon with my youngest and I'm off the hook for baking - at least for this week!